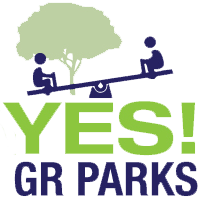 Say “YES” To Grand Rapids Parks! GR Montessori at North Park is one of several GRPS schools that would benefit from a proposed millage to be voted on this upcoming November. On Friday September 6th, the Yes! GR Parks campaign was launched, signaling a hopeful change to the City’s declining park system. The Neighbors for Parks, Pools, and Playgrounds estimates that the millage would raise $4 million annually for seven years. This money will be used for park rehabilitation and repair activities, new splash pads (replacing the old wading pools in some locations), and much more. Learn more below and help get the word out to vote ‘Yes’ on Tuesday, November 5, 2013. Yes! GR Parks campaign launches: Can a Grand Rapids tax restore the past?